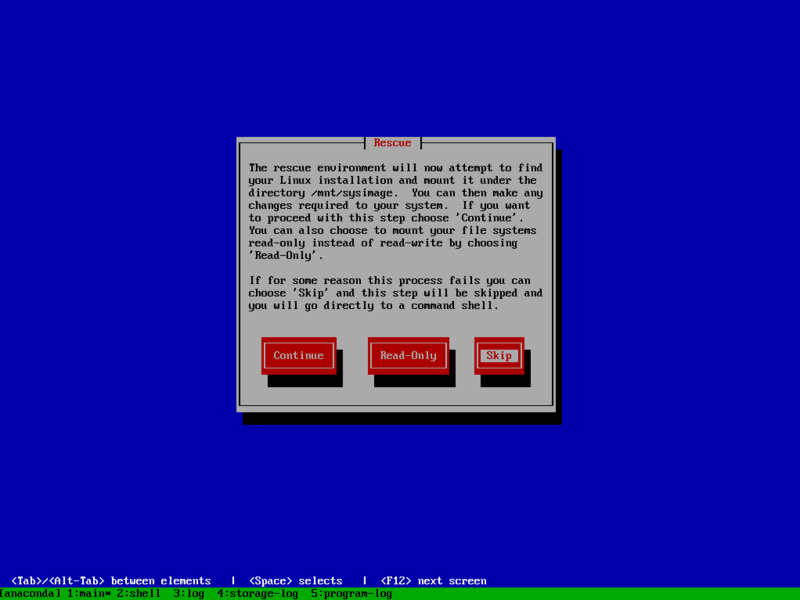 This howto represents an advanced install scenario and should not be required for regular Rockstor use; but is provided as a guide on how to accomplish the specific install arrangement of a redundant system disk install using the more established technology of mdraid, the Linux software raid subsystem. Regular install requirements are met by the default install process covered in our Quick start. 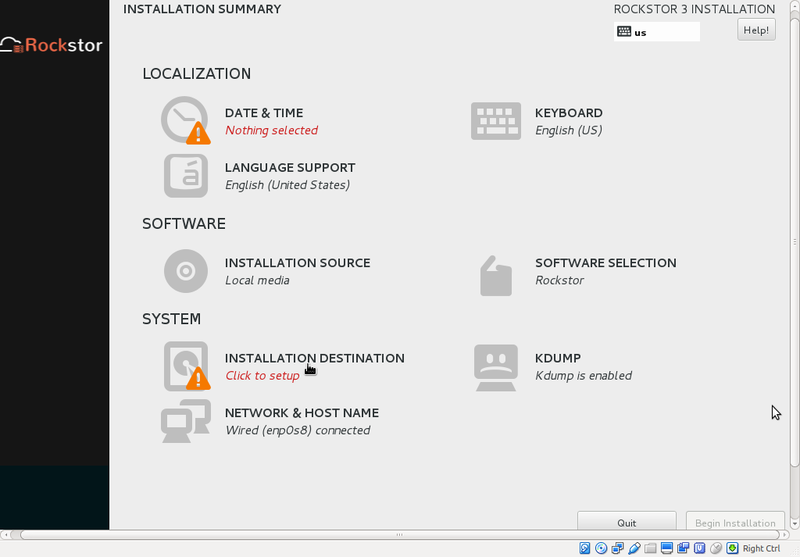 Rockstor uses Anaconda, the CentOS default installer. Although there are many gains to using an upstream installer our specific requirement in this howto of btrfs root on top of mdraid is not catered for. Adding this ability to upstream may well be possible but may also compromise Anaconda’s usability. This is due to the assumption in the installer that if one is using btrfs one will not be using mdraid; due most likely to the redundancy of this option given btrfs has raid capability build in. However, due to the btrfs filesytem’s current maturity level there are still arguments for using mdraid instead of btrfs’s raid for the system disk/disks. That is the context of this howto and in part explains it’s multi step requirement / complexity but if all steps are followed in order then a working system should result. Note though that the resulting system will require expert administration in the event of a system drive failure. 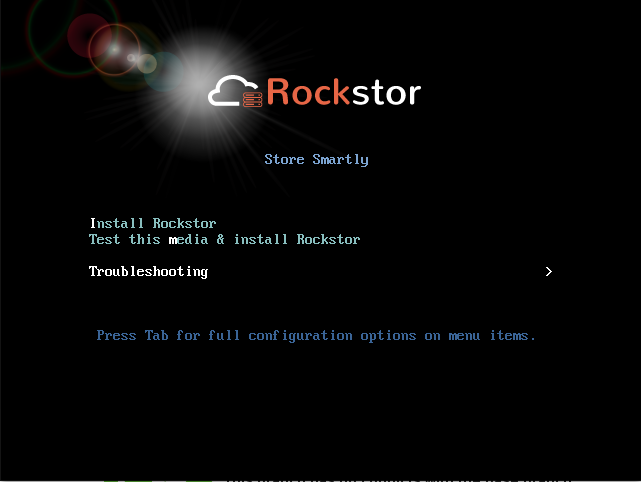 This install is only suitable for Rockstor versions 3.8-12 and newer. It’s a common and recommended practice to setup redundancy for the OS bits while installing a mission critical Rockstor server. The idea is to combine two Hard Disk Drives (HDDs) in a mirror configuration to house the OS. If one of the HDDs fails, it can simply be swapped out with a new drive saving us from a re-install or downtime. In this howto we will use Linux Raid to setup the redundant OS drive mirror. This can be done as part of Rockstor’s installation but requires many more additional steps from a default, non mdraid, install. 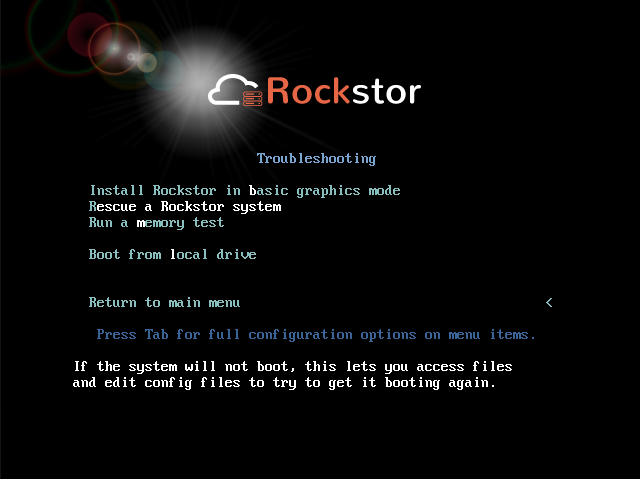 If you have never installed Rockstor before, we recommend you read our Quick start guide and watch this install video before proceeding with this howto as the default kickstarter based install method is recommended for most users. You need two HDDs to setup the mirror. We recommend HDDs of the same size and brand for uniformity. The drives can be as small as 8 GB but in practice they are usually 100+ GB. In this howto we demonstrate with a pair of 8GB virtual drives using VirtualBox and then VMM for the later sections to help distinguish the sections of the install. It is recommended not to have /boot and swap the same size as then it can be more difficult to tell them apart in a disaster recovery scenario. Due to the reasons outlined earlier this install is unusual in that it requires Rockstor be installed in effect twice. Once to setup mdraid and a second time to setup btrfs on top of the first installs mdraid setup. We also have to use the recovery system between these 2 installs in order that our proposed root md device be formatted as btrfs. The following list summarizes the necessary steps. Although this seems like a round about way to install it is currently the simplest way found without using a custom installer and only requires three command line interventions which helps to keep the process accessible to most users while leaving it as open as possible to further customizations. 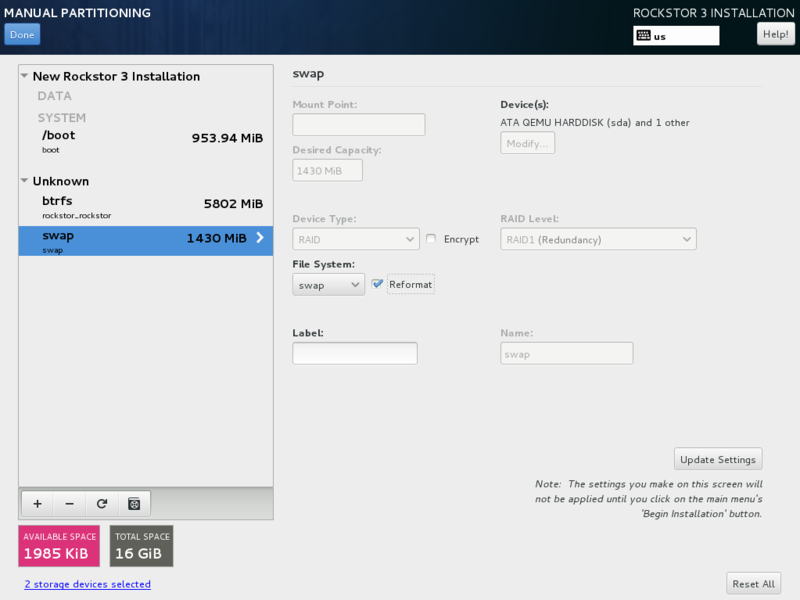 Start the Rockstor installation process and you’ll soon see the INSTALLATION SUMMARY screen. Click on INSTALLATION DESTINATION to go to the device selection screen. On the next screen, the two HDDs we are about to mirror should be visible. Click to select them so that both are ticked. In the bottom half of the screen, select the I will configure partitioning radio button. Finally click DONE at the top left. Click on the - button at the bottom to delete these partitions. Repeat this process until all of them are deleted, ot tick the dialog option to do the same. 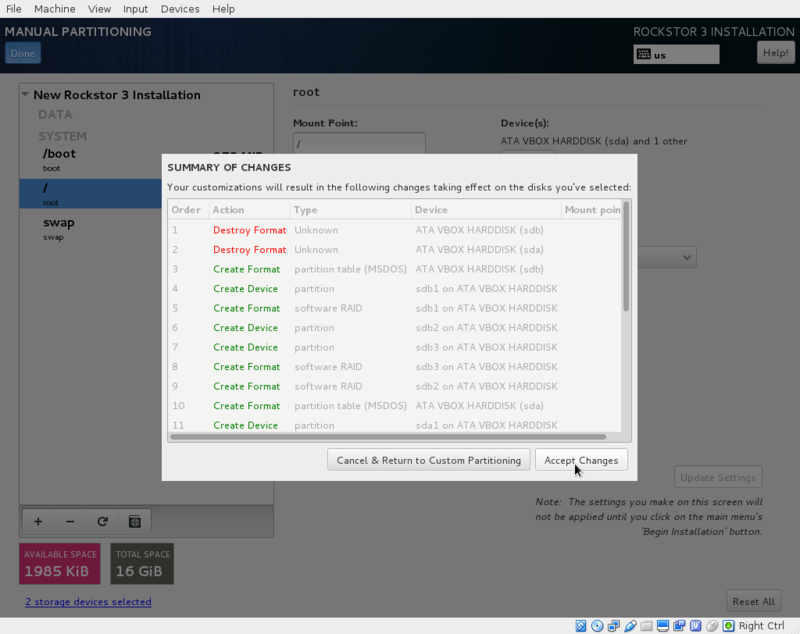 Select Standard Partitioning from the drop down menu and click the + button at the bottom left to create a new partition. A popup window will appear titled ADD A NEW MOUNT POINT. Select /boot from the drop down, enter the size you planned out earlier (minimum 1GB) and click Add mount point button. 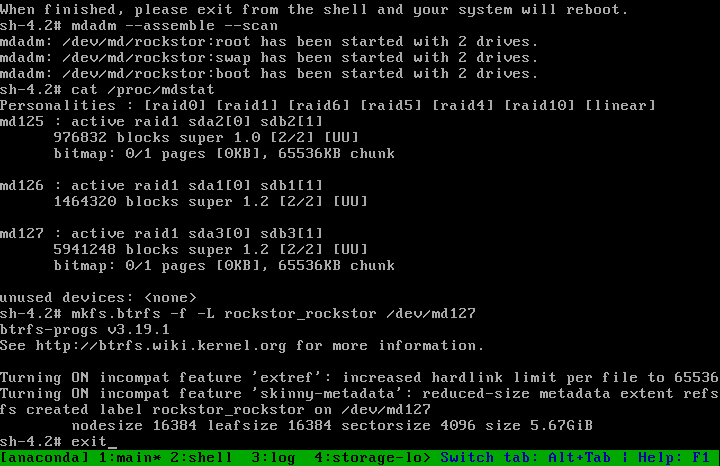 On the next screen, select RAID under Device Type, RAID 1 under RAID Level (the default) and ext4 under File System. Click Update Settings button (bottom right) to finalize the /boot partition setup. Click the + button at the bottom left to add the swap partition. The procedure is just like above but pick swap from the drop down, enter the appropriate size (1.5-4GB recommended) and click Add mount point. On the next screen, select RAID under Device Type, RAID 1 under RAID Level (the default) and swap under File System. Click Update Settings button (bottom right) to finalize swap partition setup. Redundancy on the swap partition may well introduce a performance overhead, but it does allow for hot replacement of a system raid drive if all partitions on the drive are setup with mdraid giving greater protection from drive faults. Otherwise it would be necessary to shut the machine down prior to removing or replacing a raid member drive. If live replacement is not a requirement or your hardware doesn’t support hot swapping then you can keep the default Standard Partitioning selection. This will result in a single drives swap being used until full and then the second drives swap will be used there after. Assuming a swap partition is placed on each drive. Note that this will not protect against drive failure as there will be no redundant mdraid device under the swap device. Just like in /boot above, click on the + button and pick / from the drop down. Leave the size field blank and all of the remaining space will be used. As we planned the sizes ahead of time, this will come out to be at least the minimum size of 5.5 GB given our 8 GB system devices minus the /boot and / partitions. If we are using a larger than minimum system drive size then any remaining space will result in a larger root partition which is where the space will be most useful anyway. On the next screen, select RAID under Device Type and RAID 1 under RAID Level. Click the Update Settings button to finalize the / partition setup. 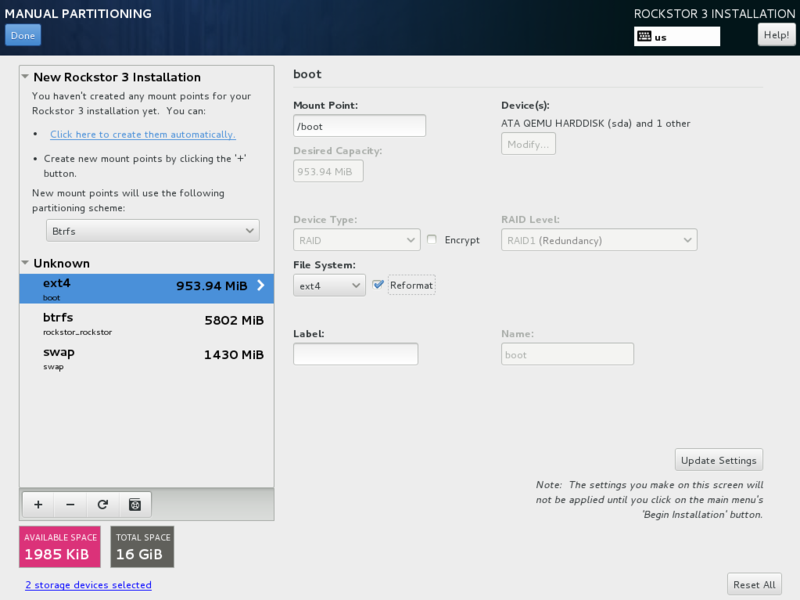 Click DONE at the top left of the screen and then click on Accept Changes to finalize the manual partition scheme. N.B. due to edits in this document the Destroy Format entries are not reflective of the removed partitions indicated earlier. Depending on your existing partitions, if any, these entries will vary. Note also in the above how the installer is about to create new partition tables on both devices and the associated partitions and the mdraid device counterparts for each of the /boot, swap, and / mount points. 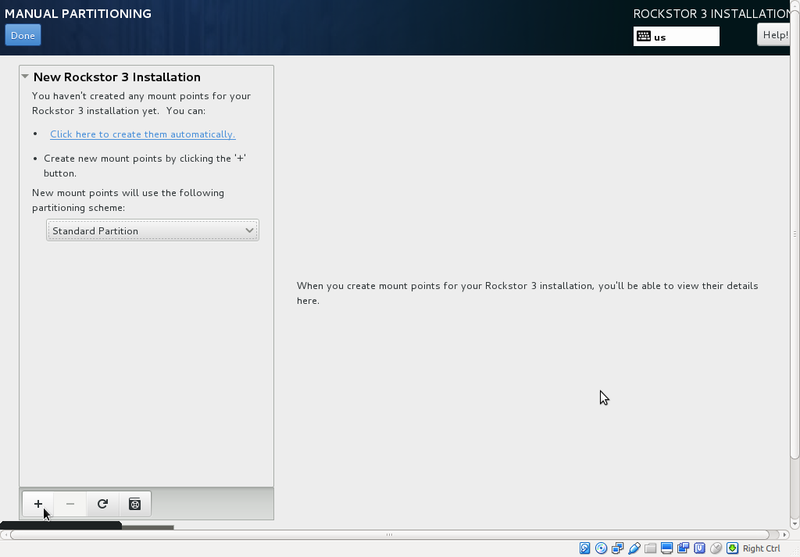 The installer will then display the INSTALLATION SUMMARY screen. Click on Begin Installation button at the bottom right to start the install. In this demonstration, we did not show other configurations such as selecting Time Zone and making sure there’s network connectivity. If you need assistance with these refer to our Quick start guide. Let the installer finish but be sure to leave the installation media in place ie do not remove the installer USB / CDROM / DVD as we must next boot into the troubleshooting section of the installer. At the following screen select Skip using the Tab and Enter keys. Note that md### is the name for the largest md device displayed by mdstat. Note you may not receive the TRIM message if not using ssd devices. Again Leave the installer media in place for the final install. Next we repeat our first install but this time we re-use the existing mdraid devices for /boot and swap and add our /home and /root subvolumes to the btrfs file system created in the previous step, ie labeled rockstor_rockstor. N.B. If a mistake is made in any of the following steps you can use the refresh icon (lower left) in all of the following MANUAL PARTITIONING screens and after clicking Rescan on the resulting dialog you will be returned to this stage where you can simply reselect both drives and try again. 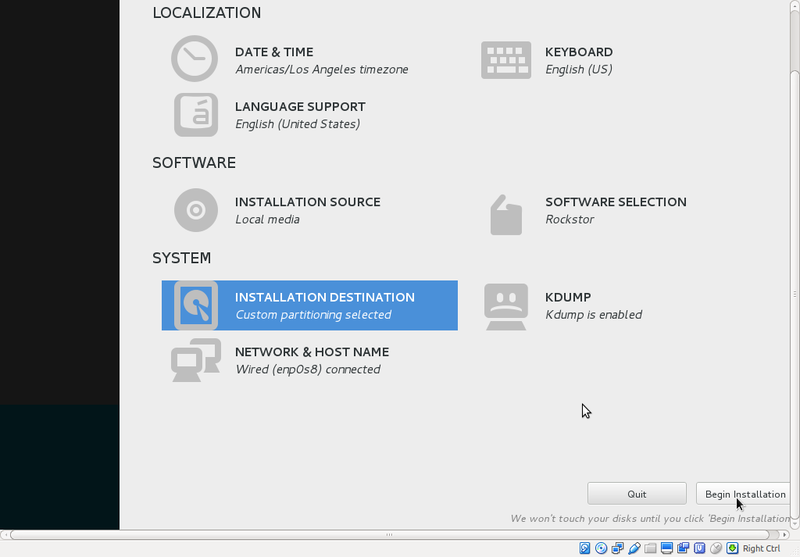 Click the Update Settings to save the mount point and reformat changes and see the partition move from the Unknown section to the SYSTEM section. This is visible in the next step’s first image. Again confirm the Reformat change using the Update Settings button. 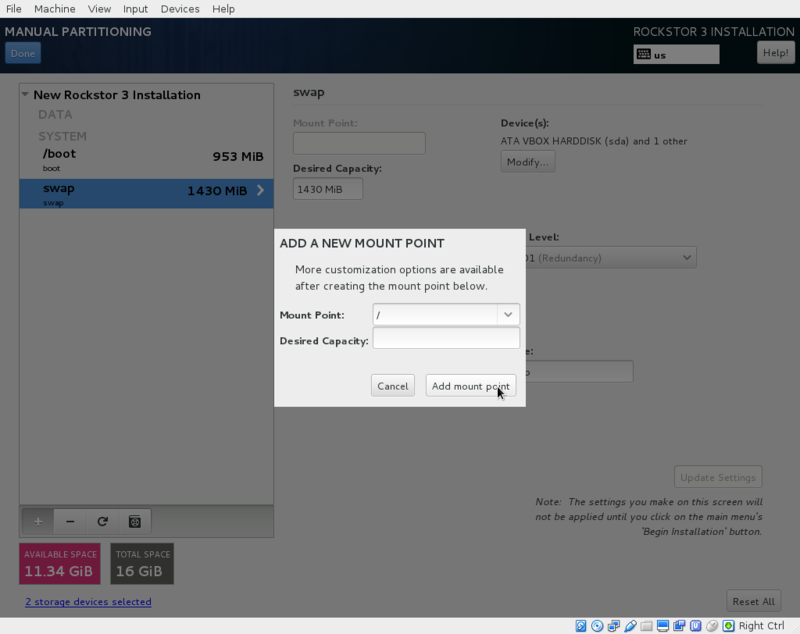 Now highlight the btrfs rockstor_rockstor entry in Unknown and click on the + icon in the lower left. Desired Capacity leave blank as quotas will define the size limit. Add mount point to proceed. N.B. the default name given to our root subvolume is root00 as an artifact of our method or as a bug in the installer. This does not respond to being changed but should be fine as is. This is a visible difference between an mdraid install and a default install. 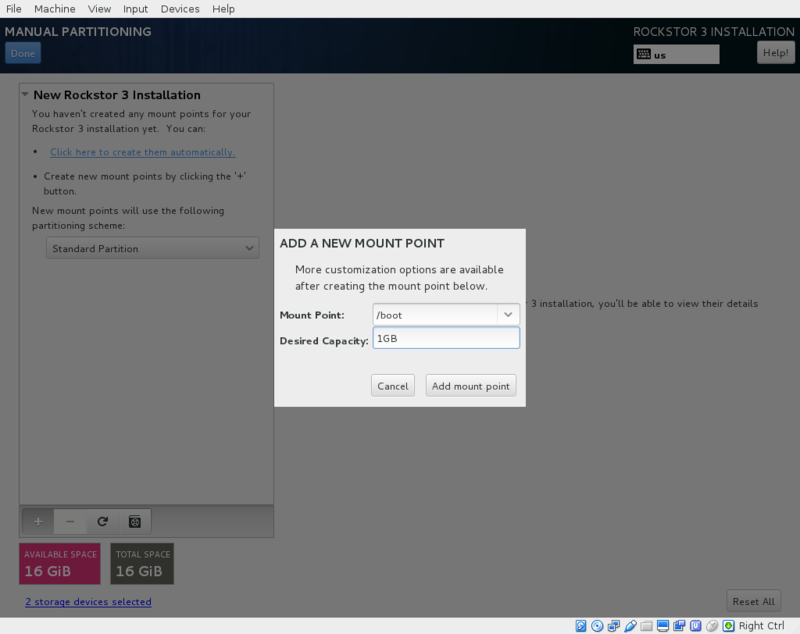 Add mount point to proceed. Notice how the installer puts the /home subvolume into the DATA section. Don’t worry about the Available Space and Total Space readings as they are not apparently aware of our mdraid levels but this does not affect the final install. Notice that due to the install not knowing our rockstor_rockstor btrfs is not on an mdraid it simply reports our /home and / mounts as Device Type btrfs and Volume rockstor_rockstor. So finally we have our btrfs on / with ext4 /boot and swap, each on their own mdraid device. If something is not right remember the refresh icon explained in Step: 9 above as this is the last opportunity for it’s use. If all looks well then Click Done and proceed. Note in the above that the format of the swap and boot are to be destroyed and re-created but there is no mention of our rockstor_rockstor file system, only the creation of the home and root00 subvolumes. Accept Changes and Begin Installation as in the first install. Remember that this time around we don’t need to reboot into the installer again, ie on completion of the install we can change the bios to boot from one of the devices in our mdraid system array. N.B. If the mdraid array did not complete it’s initial sync phase by the end of the final install then expect extended delays of up to a few minutes on the first boot of the installed system before the web interface becomes available. Also note that it may be necessary to press the carrage return on the initial console display to acquire the ip message, this is also caused by the extended delays as the system is busy syncing the mdraid in the background. This issue mainly affects slow hardware and / or large boot devices. See our Verification of the mirror section for how to read the mdraid’s status. try again to boot into default mode. Reboot the system (just type reboot and then enter) now the system should boot as normal. 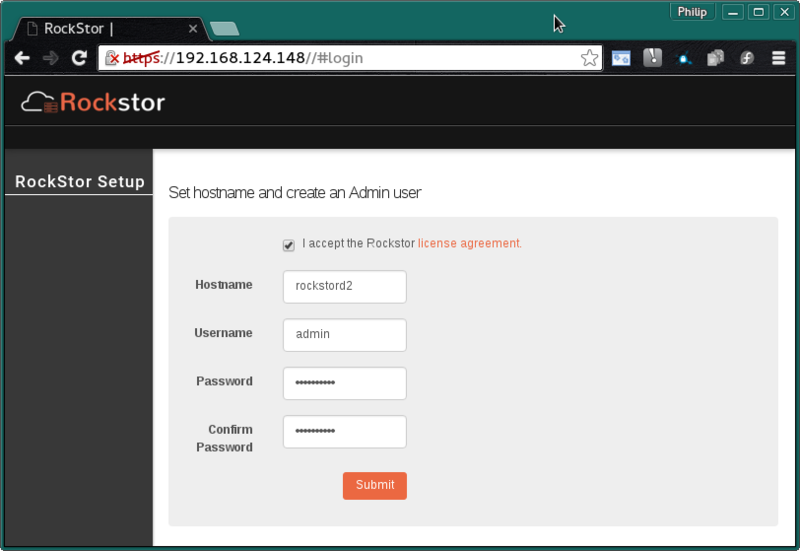 Upon successful first boot, go through the usual process of pointing a browser at the indicated ip (in the Rockstor console) and completing the configuration via the Web interface. For simplicity Rockstor ignores the swap and boot devices in this display. Note that the actual block values will vary for different partition sizes. The specific md* device names may vary from install to install, this is why it is a nice idea to have no two md devices of equal size ie /boot 1G and swap 1.5G as it can make discerning a partitions function easier. Note that the installer will by default continue this raid building / resync process on first boot which may reduce the systems performance. If you are experiencing slow response times on the first boot after install check the raid status using the above cat /proc/mdstat command. On slow hardware it may be advisable to wait until all the md devices have completed their resync. This could take anywhere from minutes to hours, but an estimated time left is given for each md device listed. Up to this point, we have setup the mirror and verified that everything looks good. Over time, usually after a long time, one of the HDDs may start throwing errors indicating that it’s time to replace it. The following steps will guide you through that process. Note that the above md names and sizes differ from our demo install above but serve as an example nevertheless. The next step is to replace the removed HDD with a new one. The same size and brand is recommended, to keep things uniform. In our demonstration, I’ve added a new 8GB virtual drive (similar to the failed HDD) and it appeared as sdb to the system. That completes the disaster recovery section and the howto! Copyright © 2015 RockStor, Inc. The Official Rockstor Documentation by various authors is licensed under a Creative Commons Attribution-ShareAlike 4.0 International License. Based on a work at https://github.com/rockstor/rockstor-doc.